By church tradition, the wise men visited Mary, Joseph, and baby Jesus in their home in Bethlehem about January 6, Epiphany Day. Epiphany season extends from January 6 to Ash Wednesday which is 40 days before Easter. In Epiphany season we celebrate saving knowledge of Christ extended to the Gentiles. We really don’t know the names of the magi that visited Jesus after his birth. In fact we don’t even know how many there were. Tradition has it that the three wise men that came to seek and honor the infant Jesus were named Gaspar, Balthasar, and Melchior. Generally, Christians believe that they were from Persia (present day Iran) and may have been influenced by the prophet Daniel. The wise men were Gentiles. 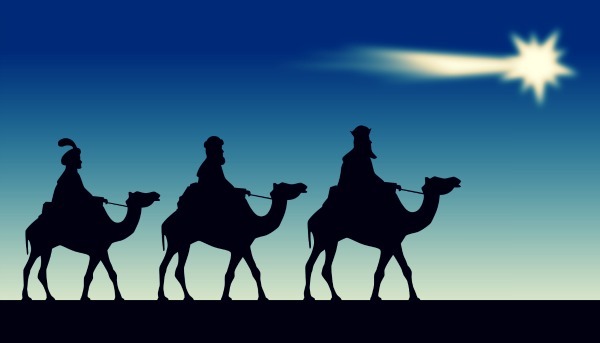 The three wise men were called magi; they were of philosophers of noble birth, educated, wealthy and influential. Although “magician” comes from the same root word as magi, these men were not magicians as we know magicians today, i.e., sleight-of-hand performers. Apparently they studied the Hebrew Scriptures. In them they found the prophecy of the seer Balaam: “A Star shall come out of Jacob; a Scepter shall rise out of Israel” (Numbers 24:17) Probably, they knew Micah’s prophecy “But you, Bethlehem Ephrathah, though you are little among the thousands of Judah, yet out of you shall come forth to me the one to be ruler in Israel” (Micah 5:2). Certainly, they understood prophecy of Daniel regarding the appearance of the Messiah (see Daniel 9:25, 26). On the night of Christ’s birth, a mysterious star appeared and persisted in the western heavens. Impressed with its importance, the wise men searched for the Messiah. They followed the star to Jerusalem and contacted King Herod to learn where the Messiah had been born. After consulting the Hebrew scripture, Herod told the wise men that the Christ child would be born in Bethlehem. The wise men left Jerusalem and traveled to Bethlehem. They saw the child and offered him gifts of gold, frankincense, and myrrh. By this time, perhaps 6-12 months after Mary gave birth to Christ, the family lived in a house that Joseph found for his family. After worshiping the Christ child and giving their gifts, the wise men returned to their own country without traveling back to Jerusalem. They had been warned in a dream that King Herod wanted to kill the child because Herod believed that the Messiah threatened his rule. When Herod learned what happened, he was furious. Herod ordered soldiers to go to Bethlehem and kill all male Jewish children two years of age and younger. He wanted no possible challenge to his rule! Before Herod’s soldiers arrived in Bethlehem, Joseph had a dream telling him to take Mary and Jesus and flee to Egypt. Joseph stayed in Egypt until King Herod died. Joseph was able to fund the trip with his family to Egypt using the gold, frankincense, and myrrh given to the family by the wise men. Reflection: Have you ever noticed how God always provides for the things he plans for us to do? This entry was posted in Magicians and tagged 3 wise men, and Melchior, Balthasar, Bethlehem, Gaspar, King Herod, Lesser Known Bible Characters, Messiah, Obscure Characters, star. Bookmark the permalink.